where the river rushes by. where the sun sets over the ocean. where gulls and eagles fly. 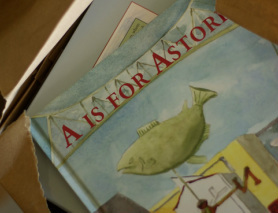 "I have literally read hundreds and hundreds of children's books in my day's past as an elementary school teacher, and I am very impressed with A is for Astoria. I have read it to my grandsons at least 6 times, and it is charming and informative for all of us. You should be very proud of this book."